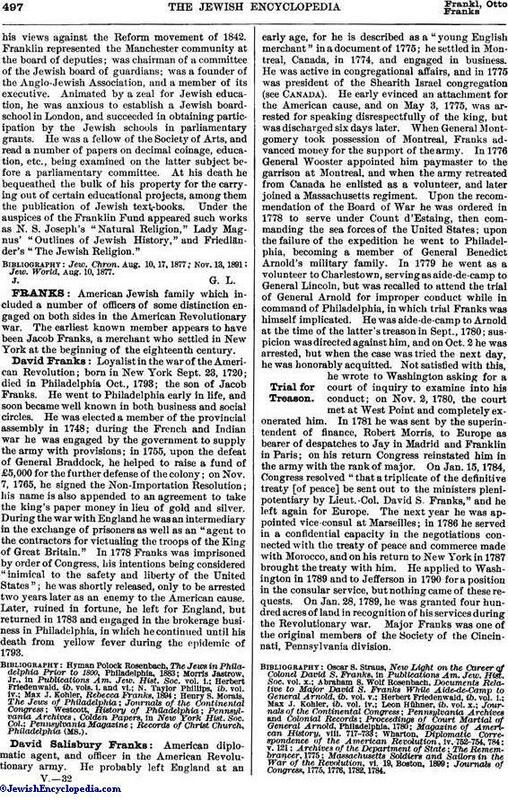 American Jewish family which included a number of officers of some distinction engaged on both sides in the American Revolutionary war. The earliest known member appears to have been Jacob Franks, a merchant who settled in New York at the beginning of the eighteenth century. Loyalist in the war of the American Revolution; born in New York Sept. 23, 1720; died in Philadelphia Oct., 1793; the son of Jacob Franks. He went to Philadelphia early in life, and soon became well known in both business and social circles. He was elected a member of the provincial assembly in 1748; during the French and Indian war he was engaged by the government to supply the army with provisions; in 1755, upon the defeat of General Braddock, he helped to raise a fund of £5,000 for the further defense of the colony; on Nov. 7, 1765, he signed the Non-Importation Resolution; his name is also appended to an agreement to take the king's paper money in lieu of gold and silver. During the war with England he was an intermediary in the exchange of prisoners as well as an "agent to the contractors for victualing the troops of the King of Great Britain." In 1778 Franks was imprisoned by order of Congress, his intentions being considered "inimical to the safety and liberty of the United States"; he was shortly released, only to be arrested two years later as an enemy to the American cause. Later, ruined in fortune, he left for England, but returned in 1783 and engaged in the brokerage business in Philadelphia, in which he continued until his death from yellow fever during the epidemic of 1793. Records of Christ Church, Philadelphia (MS.). David Salisbury Franks: Trial for Treason. American diplomatic agent, and officer in the American Revolutionary army. He probably left England at an early age, for he is described as a "young English merchant" in a document of 1775; he settled in Montreal, Canada, in 1774, and engaged in business. He was active in congregational affairs, and in 1775 was president of the Shearith Israel congregation (see Canada). He early evinced an attachment for the American cause, and on May 3, 1775, was arrested for speaking disrespectfully of the king, but was discharged six days later. When General Montgomery took possession of Montreal, Franks advanced money for the support of the army. In 1776 General Wooster appointed him paymaster to the garrison at Montreal, and when the army retreated from Canada he enlisted as a volunteer, and later joined a Massachusetts regiment. Upon the recommendation of the Board of War he was ordered in 1778 to serve under Count d'Estaing, then commanding the sea forces of the United States; upon the failure of the expedition he went to Philadelphia, becoming a member of General Benedict Arnold's military family. In 1779 he went as a volunteer to Charlestown, serving as aide-de-camp to General Lincoln, but was recalled to attend the trial of General Arnold for improper conduct while in command of Philadelphia, in which trial Franks was himself implicated. He was aide-de-camp to Arnold at the time of the latter's treason in Sept., 1780; suspicion was directed against him, and on Oct. 2 he was arrested, but when the case was tried the next day, he was honorably acquitted. Not satisfied with this, he wrote to Washington asking for a court of inquiry to examine into his conduct; on Nov. 2, 1780, the court met at West Point and completely exonerated him. In 1781 he was sent by the superintendent of finance, Robert Morris, to Europe as bearer of despatches to Jay in Madrid and Franklin in Paris; on his return Congress reinstated him in the army with the rank of major. On Jan. 15, 1784, Congress resolved "that a triplicate of the definitive treaty [of peace] be sent out to the ministers plenipotentiary by Lieut.-Col. David S. Franks," and he left again for Europe. The next year he was appointed vice-consul at Marseilles; in 1786 he served in a confidential capacity in the negotiations connected with the treaty of peace and commerce made with Morocco, and on his return to New York in 1787 brought the treaty with him. He applied to Washington in 1789 and to Jefferson in 1790 for a position in the consular service, but nothing came of these requests. On Jan. 28, 1789, he was granted four hundred acres of land in recognition of his services during the Revolutionary war. Major Franks was one of the original members of the Society of the Cincinnati, Pennsylvania division. Journals of Congress, 1775, 1776, 1782, 1784. Officer in the American Revolutionary army; born in New York May 27, 1759; died in Philadelphia March 4, 1822. At the outbreak of the war in June, 1776, when only seventeen years old he enlisted in Colonel Lesher's regiment, New York Volunteers, and served with it in the battle of Long Island; on Sept. 15 of the same year he was taken prisoner at the capture of New York, but effected his escape after three months' detention. In 1777 he was appointed to the quartermaster's department, and in Jan., 1778, he was made forage-master, being stationed at West Point until Feb. 22, 1781, when he was appointed by Congress ensign in the Seventh Massachusetts Regiment; he continued in that capacity until July, 1782, when he resigned on account of ill health. In 1789 Franks was appointed a notary and tabellion public of the Commonwealth of Pennsylvania; in 1794 Governor Mifflin commissioned him lieutenant colonel of the Second Regiment, Philadelphia county. It was in his house at Germantown, a suburb of Philadelphia, that President Washington resided during the prevalence of yellow fever in the city in 1793. He was appointed in 1795 a justice of the peace for the townships of Germantown and Roxborough. On Feb. 18, 1819, he was made prothonotary of the Supreme Court of Pennsylvania, and help that position until his death three years later. Colonel Franks' portrait was painted by Gilbert Stewart, and is now in the Gibson Collection of the Pennsylvania Academy of the Fine Arts, Philadelphia, with whose permission it is reproduced here. Papers of the Supreme Court of Pennsylvania (MSS. in the possession of the Pennsylvania Historical Society, Philadelphia). Private in the French and Indian war; his name is included in a list of Captain van Braam's company, dated July 9, 1754, and in a list of those "who have received His Excellency's bounty money." Journal of Colonel George Washington, ed. by J. M. Toner, pp. 177, 194, 203, Albany, 1893. 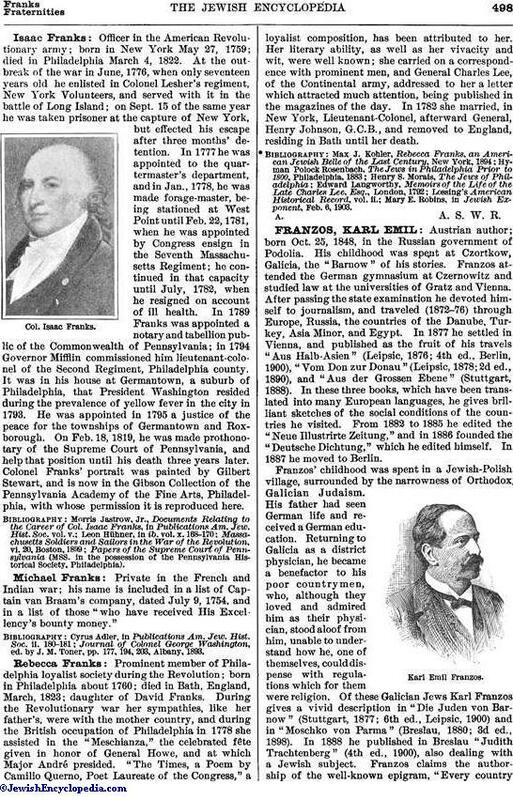 Prominent member of Philadelphia loyalist society during the Revolution; born in Philadelphia about 1760; died in Bath, England, March, 1823; daughter of David Franks. During the Revolutionary war her sympathies, like her father's, were with the mother country, and during the British occupation of Philadelphia in 1778 she assisted in the "Meschianza," the celebrated fête given in honor of General Howe, and at which Major André presided. "The Times, a Poem by Camilio Querno, Poet Laureate of the Congress," a loyalist composition, has been attributed to her. Her literary ability, as well as her vivacity and wit, were well known; she carried on a correspondence with prominent men, and General Charles Lee, of the Continental army, addressed to her a letter which attracted much attention, being published in the magazines of the day. In 1782 she married, in New York, Lieutenant-Colonel, afterward General, Henry Johnson, G.C.B., and removed to England, residing in Bath until her death. Mary E. Robins, in Jewish Exponent, Feb. 6,1903.